Celebrating 15 years in business, South West Refrigeration are truck and trailer specialists in transportation refrigeration sales and service. Based in Annacotty Business Park in Co. Limerick, the company is an agent for Thermo King – the world leader in transport temperature control. 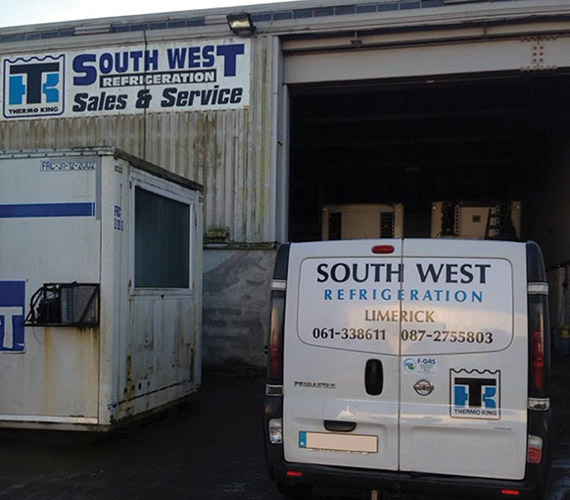 Frank Quinn founded South West Refrigeration in 2003 and has since seen it grow into one of the most respected and successful businesses of its kind in the Munster area. Operating from a 5,000 sq. ft. state-of-the-art premises in the busy Annacotty Business Park on the outskirts of Limerick city, the company provides its large client-base with a comprehensive service ranging from vehicle insulation and refrigeration to computerised fault finding. Along with offering expert advice, South West Refrigeration insists on using quality components and equipment at reasonable prices to meet all your refrigeration installation, repair and maintenance requirements. “Our service and knowledge of the business is second to none,” Frank proudly declares. Thermo King continues to shape the transport temperature control systems industry by providing trusted solutions for truck, trailer, marine and rail customers. Founded in 1938 and a brand of Ingersoll Rand, Thermo King’s quality products and services are recognised around the world for reliability, efficiency and innovation. Customers have peace of mind that Thermo King will keep them running at maximum capacity to grow their business. Thermo King currently has nine plants in six countries. Customers get the same high product quality whether their units are manufactured in Galway, Wujiang or Kolin. The brand’s network reach provides service almost anywhere in the world. Thermo King supports a parts and distribution system that can deliver any of 20,000 parts, anywhere in the world, overnight. Furthermore, Thermo King dealers receive ongoing training to stay up to speed on new technology, products and industry requirements. The training goes beyond the service side which includes product installation, diagnostics and maintenance. Dealer salespeople are educated on the latest market rules and requirements, enabling them to find the best solution for each customer. Frank and Martin are both qualified CERTI-TECH technicians and can service and repair all makes of transportation refrigerated units. They’re available 24 hours a day, 365 days a year to help with any issue their customers may have. In addition, they have service plans and budgets to suit their customers’ needs and pride themselves on being the perfect service partner. South West Refrigeration stocks a huge range of parts to minimise downtime and get your refrigerated units serviced and back on the road as quickly as possible. “We are committed to providing a prompt, friendly and top-quality service and will go the extra mile for our customers when the need arises. If they are not happy with us, they will go elsewhere, but fortunately we enjoy a good relationship with all of our customers,” explains Frank, who is a native of Annacarty in Co. Tipperary. According to Frank, one of the biggest challenges his business faces is coping with the decline in customers with small refrigerated fleets. “The trend is definitely towards bigger fleets. We have a lot of customers with one or two refrigerated units, but they are being gradually squeezed out by the big boys. The big supermarket chains have their own fleets now which they’re maintaining themselves. It’s posing a major challenge for us and is probably the main reason why we have no plans to expand at the moment. We’re happy just to consolidate and hold on to what we have for now,” he says. Frank and Martin have worked hard to establish South West Refrigeration as a trusted business partner to the transport temperature control industry. The company’s ongoing investment in specialist equipment, software and electronic communications ensures it provides its customers with the fastest response times and the industry’s best technicians. With a large stockholding, South West Refrigeration can ensure you that essential parts and accessories are always at hand, while a direct link to Thermo King’s parts headquarters guarantees speedy access to non-stock items. The company’s aim is to surpass its customers’ expectations and ensure they are completely satisfied. It has the expertise and support to quickly diagnose breakdowns and take effective remedial action, thereby minimising the effect on your business.